A spy mission, a Holocaust tale, and a first-class work of nonfiction. In 1945, at the end of World War II, Adolf Eichmann, the head of operations for the Final Solution, walked into the mountains of Germany and vanished from view. Sixteen years later, an elite team of spies captured him at a bus stop in Argentina and smuggled him to Israel, resulting in one of the century's most important trials--one that cemented the Holocaust in the public imagination. 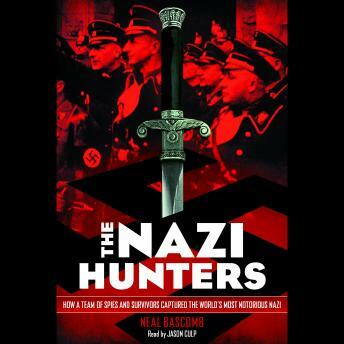 THE NAZI HUNTERS is the thrilling and fascinating story of what happened between these two events. Survivor Simon Wiesenthal opened Eichmann's case; a blind Argentinean and his teenage daughter provided crucial information. Finally, the Israeli spies--many of whom lost family in the Holocaust--embarked on their daring mission, recounted here in full. Based on the adult bestseller HUNTING EICHMANN, which is now in development as a major film, and illustrated with powerful photos throughout, THE NAZI HUNTERS is a can't-miss work of narrative nonfiction for middle-grade and YA readers.